Ty Seager fights for a loose ball. The freshman forward and the Wildcats saw their season end with a loss in the Big Ten Tournament. It only took a minute to end a season. Northwestern’s (6-11-1, 3-4-1 Big Ten) season came to an end Saturday as No. 17 Indiana (11-1-6, 3-0-5) defeated the Wildcats in the Big Ten Tournament quarterfinals 1-0. 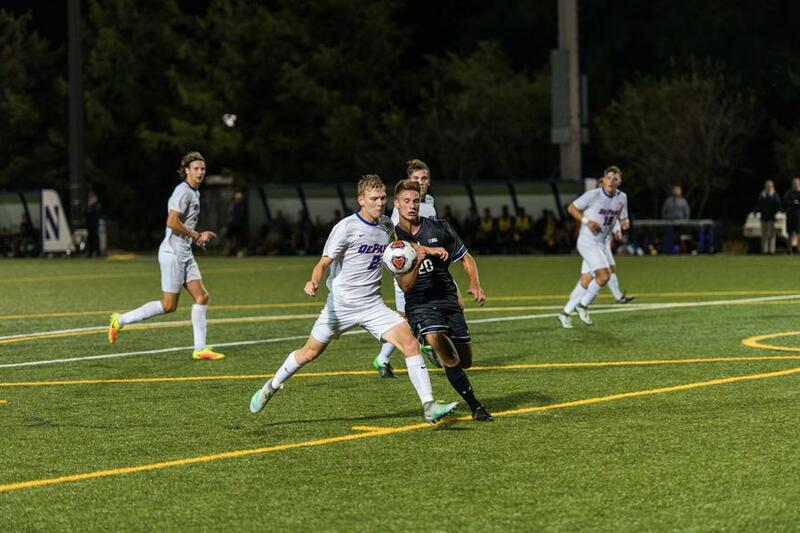 The Cats drove the Hoosiers to overtime in their quarterfinals meetup, but Indiana midfielder Trevor Swartz scored within the first minute of the extra session to give the Hoosiers the win. It was the second meeting between the two teams this season following a September tie in Bloomington. On the stat sheet at least, NU improved significantly from the first game to the second. The Hoosiers outshot the Cats 28-3 in September, but NU doubled its output and cut down Indiana’s scoring opportunities significantly in their tournament matchup. “They are a much better team than when we played them a month and a half ago, and we’re a much better team than we were a month and a half ago,” Lenahan said. During the first half, the Cats’ defense held strong against an Indiana team that came out aggressive, controlling possession for most of regulation. Though NU shot six times during the game, none of the chances were on goal. The closest opportunity NU had came in the second half, when senior forward Mike Roberge shot just shy of the net after receiving a drop-off pass. Sunday’s game was Roberge’s final match before graduation, and he said he left the field with no regrets. Junior goalkeeper Francisco Tomasino, who stopped a potential own goal during the last minute of regulation time, said the end of the season is always rough because of having to say goodbye to the seniors. Tomasino said even though the season ended with a loss, the team showed marked improvement over the course of the season. He said the team will take a “nice little break” now before coming back in the winter for the off-season. “We’ll look into carrying that energy we had, that momentum we had at the end of the season and try to keep that going,” he said.